You asked yourself this question already. At least once. But… what if you had the answer? What if a different Header image brought us more traffic? What if a new Call to Action text got us more leads? Well, the possibilities will always haunt your choices, but to some degree, we can actually answer the “What if?”. The answer is simple, elegant and sounds pretty too: A/B Testing. 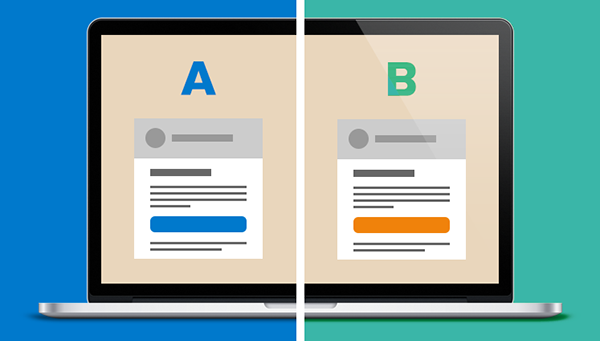 Generally, the A in A/B testing means what you do today. The Headline you wrote in 5 seconds, the Call to Action text you wrote 10 years ago and the logo you created using paint. The B, is usually your “What If”. Is what you would change, but just want to make sure it’s going to work. A/B Testing is commonly used to test Headlines, Layout, Colors, Call to Actions but it can basically be used to test anything in your web site. Collect Data: Your analytics tool will provide you with enough information to get us started. To begin, look for high traffic/low conversion areas of your website or app to improve them. Set your goals: Define a metric to measure the success of each variation. Be it a click, a newsletter subscription or even a product purchase. Look for the behavior you want to happen and measure it. Create Variations: Use your A/B testing software (I’ll list a few at the bottom) to create these variations to an element or aspect of your application. Some tools have visual editors to make this process a whole lot easier. Note: Make sure you test the variation so it’s functionality is functioning properly. Run the experiment: From this point on, your visitors will randomly be presented with either our control (our A) or our variation (our B). The interaction with each of them is measured and stored to be compared. Analyze our data, draw our conclusions: After the experiment, we’ll compare how each variation performed considering our metrics. If the variation was better, maybe it’s time to make a chance, or if it isn’t we just dodged a bullet, haven’t we? Sometimes, what we learned in this experiment can be applied to other areas of the website and we can still keep iterating on the experiment to improve results. Optimizely: With a rich and easy to use visual editor, Optimizely is easily one of the best tools available out there. The main reason I recommend Optimizely is the ease with wich one can start creating tests and the fact that to create simple A/B Tests it’s completely free. In case you need some fancy features, you’ll need to get in touch with their sales team. Unbounce: The tool to test your pages. Almost anywhere you look on the web, someone is giving good reviews about Unbounce. Personally, I’ve never used their system, but I know a good deal of people that do. Most of them say the same thing: It’s worth it. Unbounce is priced at a starting $49 monthly on their plan focused on new and growing business and can grow (based on the custommers needs) to $199 monthly. Visual Web Optimizer: VWO calims to be the “World’s Easiest A/B Testing Tool” and to be fair, I believe they deserve the title. The system is pretty simple but really powerful but, as the tools I’ve recommended above, VWO it’s not just a A/B Testing tool, it’s a package of tools, all wrapped up in a little box designed to optimize your website. Did I forget one of your favorite tools, said something outstandingly wrong or your genuinely enjoyed the post? Leave a comment below, I’ll be happy to answer it. This entry was posted in Advertising, Analytics, Marketing Tools, Website Design. Bookmark the permalink.